Hey look, my knees are purple! In our Philosophy class we talked about the public space and how we don’t use it anymore. It has become a danger zone where we humans don’t like to be in, we try to cross it as invisible as possible. Our teacher encouraged us to do something unexpected, to stand out, to use the public space in a unique way. I put his words into action and went out on this warm spring evening to take my photos in a busy spot. Awkward stares galore! In a few months we have a philosophy assignment and some of my classmates chose to do an invisible theathre. A thing where you try to evoke reactions from an ignorant public. The Candid Camera way. This might make for a fun experiment! I love your outfit and I especially love your shoes. Now a days it is always hard to find someone who stands out in a crowd who tries so hard to just fit in and do what everyone else does. Would love to hear about how your philosophy assignment goes. I like the striped top with the skirt! Very nice! Nikki, I love this outfit and the movement captured in your poses. Simply lovely. Aw yay! What a great experiment and you did extremely well. Kudos to you! I love your mustard tulip skirt and those adorable stripes! Great post! Dit is denk ik mijn favoriete post van jou. Heel mooie foto's en je outfit is helemaal mijn ding. Klopt ook helemaal wat je zegt over de publieke ruimte, het is gewoon super eng en not done om iets te doen behalve snel wandelen van de ene plaats naar de andere plaats. That sounds really interesting! I've got a lot better at taking my photos in public (like my last post, there was a family running in circles around the statue in the middle, right past me) and it didnt bother me. I got stares from the people that walked past the garden, but I didnt care. Shane on the other hand does haha! He always stops and I'm like just carry on!! hahah! En wauw, zo mooi slank dat je bent 🙂 Ik zou ook wel wat slankere benen willen hebben! I LOVE your necklace!! The outfit is great and what a great experiment! 1. I love these pictures. Where are they taken? The scenery is so beautiful! 2. Philosophy is my jam. Is that your major? I love your note on the public space.. so true. And, great to see the inspiration behind the shot!! I love this mustard color.. and that necklace is gorgeous. I love this outfit! Mustard yellow is such a perfect color. You are so pretty! You look great! Love the skirt. So glad you braved the awkward stares & used the public space. I think it's an important thing we've been ignoring for a while. I must say the same thing, they go great like peanut butter and jelly! lol! Love your nautical theme!!! The mustard with the boats looks amaazzzzing and with your hair is FABBBULOUS! Great styling! Love the stripes with the mustard skirt. Such a cute combination. And I love the backdrop of your pictures. So lovely. I love this experiment! and i love stripes and mustard. you look good! Cute look! Love the mustard skirt! You look super cute! Love the yellow skirt! Your necklace is so beautiful! It goes perfectly with that skirt! I love this yellow skirt, its the perfect addition for spring! Love that the post was inspired by your class, such a great idea! Gorgeous skirt! Adore the color! Cute skirt, I love mustard and stripes together 🙂 That necklace is so pretty! You're so brave to take photos at a busy spot, was it with your tripod or did you have a photographer? navy stripes and mustard are classic. they will always work. there is something so nautical about it…perfect, since you're at the harbor! Sounds like a great experiment! I love the mustard color on you. This is such a bright and fresh look, there's something so happy about these colours and the stripes! Beautiful! your yellow skirt is awesome! and i bet that must've felt wierd getting awkward stares lol, you look fab though! 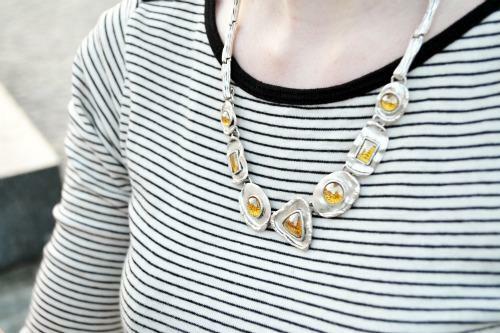 Stripes and mustard are definitely always perfect together! Nice location too! Heel mooi, en leuke foto's ook :). Heel erg leuke foto's Nikki! Die ketting staat je heel erg leuk en past ook héél erg mooi bij je outfit 😀 ! staat je heel goed, dat gele ! The colour mustard goes so well with your hair! Excellent use of public space! oooo I love this combination! That skirt looks amazing on you! Love the necklace too. I hate taking photos in public, but that may be because I use the self-timer… It's such a lovely location – worth the stares! Nikkiii!!! It's so weird that right after your comment about your mom contributing to your DSLR, I found out that my parents are getting one for me!!!! I'm so exciting, I'm flipping out! Waaaaahooo!! Anyway, sorry that was such a spastic comment, but I felt like it was necessary. That is so brave of you! Some days I'm too anxious to go to a super busy place and not do something to stand out. I think its awesome you did that! And this outfit is great by the way! Your necklace is gorgeous! Love the yellow as well. The color of skirt is amazing! So cute ! I love that !